I posted this old recipe a few years ago, but it didn’t make the move from the old blog. 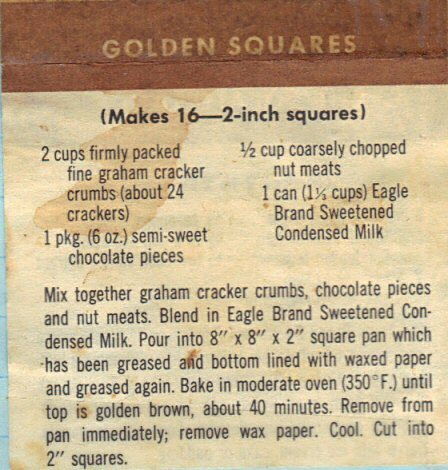 I thought I’d just scan the 40-plus-year-old recipe I have taped to an index card. Just three ingredients (I leave out the nuts) for the richest, densest, sweetest treat EV-AH! I don’t bother with the waxed paper, I just use butter or cooking spray. I occasionally make myself feel marginally better by using low-fat sweetened condensed milk. It doesn’t affect the quality of the product (or make me feel much less guilty). I do think of my mom whenever I make these, since she made them as a special treat for me, and that makes me feel good. My mom made those too, but she did hers in layers with the addition of a layer of butterscotch chips and one of coconut. Then she poured the sweetened condensed milk over everything. Oh, and she always started with melted putter in the bottom of the pan — no wax paper for Theona! Thanks for posting that — it’s nice to have a mom-memory. I kind of want to eat these right now. Next post: my lucky year!